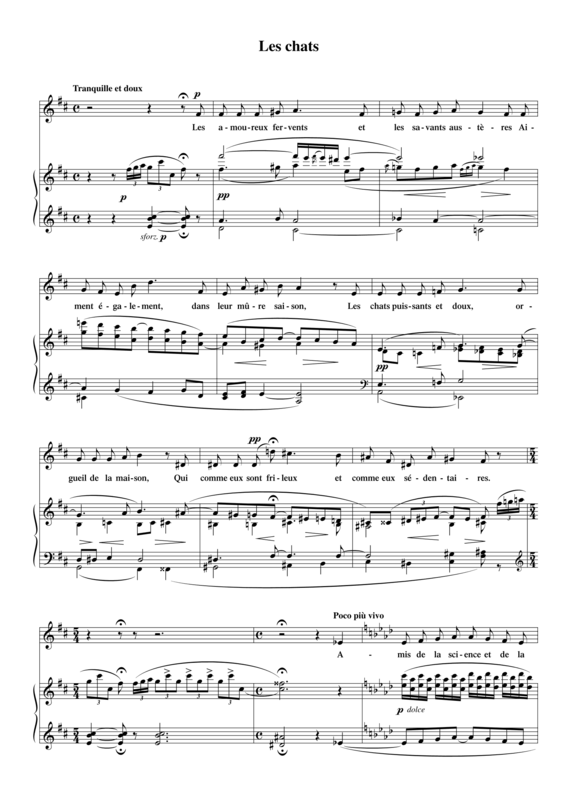 After setting Baudelaire’s Recueillement (Contemplation, RC 79) for alto and piano and then orchestrating the song (RC 80) in the summer of 1907, at the beginning of October Diepenbrock started the instrumentation of Les chats (The Cats, RC 68), which he had written for Johanna Jongkindt in February 1906. The correspondence from those years gives no insight into how this score came about. Much later, at the end of July 1918, Diepenbrock mentioned correcting the orchestral parts in a letter to his wife. They had been made for the premiere that was to take place in the Scheveningen Kurhaus on 4 August, at a Sunday evening concert by the Residentie Orchestra under the French conductor Rhené-Baton (1879-1940). The soloist in Les chats was Elisabeth Ohms (1888-1974), a singer who was to become an internationally renowned Wagner interpreter in the 1920s. Performing under her initial stage name Lise Ohms, she also sang Diepenbrock’s Berceuse (in the setting for voice, cello and piano) that evening. As far as we know there are no reviews of this summer concert. Diepenbrock did not mention her performance anywhere in his letters either. The colour of the first five measures is completely determined by the woodwinds that also play the motive marking the transition from one strophe to the next almost every time. Later Diepenbrock assigned this motive to the solo violin. Other sections of the song are characterised by the full sound of all the strings.